In 2002 an anonymous donor provided funding for sixth graders at Morse Pond School to create sculpture for their school courtyard. I was asked to be the artist-in-charge. 12 kids were selected by their art teachers to be on the sculpture team. They brimmed with talent and enthusiasm! 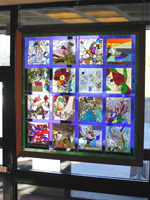 As the Artist-In-Residence at the Cape Cod Community College in the fall of 2000, I taught an impromptu class in stained glass. Anyone in the community who was interested in a crash course in the techniques of stained glass was invited. Our plan was to take the pieces they made and weave them into a glass quilt to hang in the lobby of the art center.